Little Black Bomber / / Where Cheddars are concerned, our multi-award winning Little Black Bomber® is a modern classic. Our flagship cheese marries a delicious rich flavour with a smooth creaminess, lasting long on the palate but remaining demandingly moreish! Tunworth / / A Camembert-style cheese made by Stacey Hedges and Charlotte Spruce in Hampshire. Rich, sweet, nutty and milky with a pleasingly cabbagey flavour. Very highly recommended. Not suitable for vegetarians. Tomme de Chèvre de Savoie / / An artisanal goat’s milk cheese made in Savoie and Haute-Savoie regions of France, in the valleys of Abondance, Maurienne and Tarentaise in particular. Wild Garlic Yarg / / Our Wild Garlic Yarg is wrapped in the aromatic ramson leaves that arrive in the Cornish woodlands each spring. These bright green beauties impart a gentle garlicky flavour and give the cheese a slightly firmer texture. Ossau-Iraty / / A cherished ancient Pyrenees sheep’s milk cheese. It’s sometimes called the “farmer’s dessert” for its creamy and buttery texture and its fruity, slightly floral flavor. We love it for dessert—and pretty much any time. Ossau-Iraty was granted European PDO status in 1996. Ogle Shield / / British cheese made using beautifully rich raw Jersey milk by Jamie Montgomery & Wayne Mitchell of Montgomery cheese making family. The cheese is washed in special brine every three days to attain a slightly pungent sticky rind, which softens the cheese paste and significantly intensifies its flavour. Brie de Meaux / / This is a raw, soft unpasteurised cow’s milk cheese covered with a bloomy rind. with biscuits, breads and condiments. 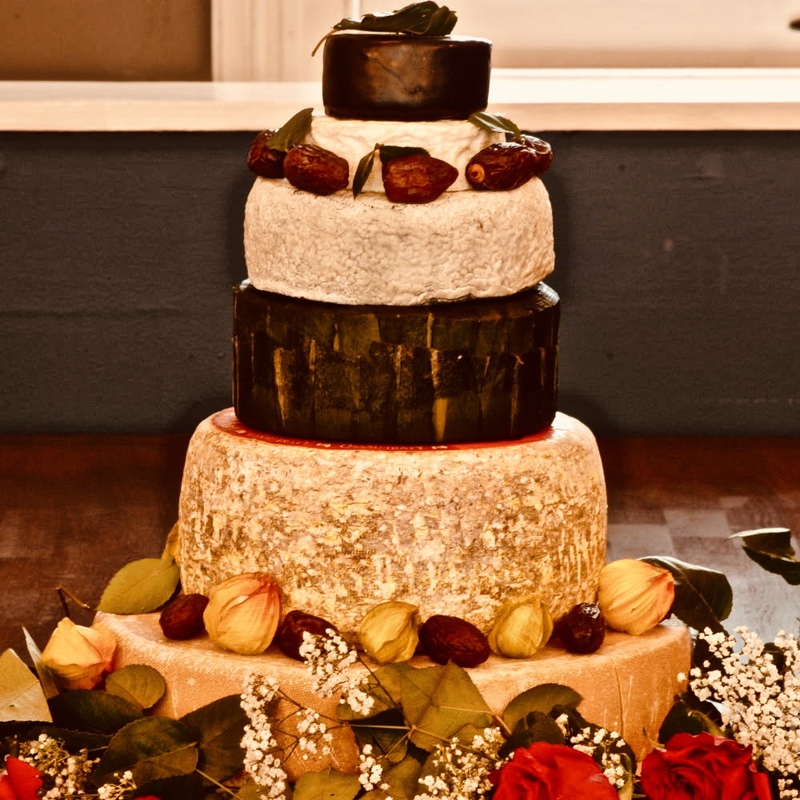 In recent years, a modern trend for weddings is to opt for an alternative to the traditional sweet wedding cake and choose a wedding cheese (or cheese-tower). A wedding cheese can add that savoury touch of class to one of the most important days in a couple’s life. If you are a lover of high-quality cheeses then this could be the perfect option for you. At A&H we taste-test our cheeses on a daily basis to make sure our selection provides the maximum amount of flavour. We are proud of our stock, and we think it’s one of the finest fromageries in the city. Our curation process makes A&H the best place for finding the best, rarest and most interesting cheeses on the market today. We source from some of the best dairy farms across the UK and Europe, and quality is at the forefront of our decision-making process. We regularly supply high-quality rare cheeses to some of Birmingham’s finest eateries and restaurants. Our beautiful wedding cheese towers usually consist of larger, harder cheeses on the base with softer smaller cheese wheels on the top. The selection and order can be tailored using up to ten varietals, packing a wide range of flavours. Your tower can have anything on it. British, French, Italian, hard, gooey, creamy or blue. We then select the best order for the tower and pick the finest selection of condiments, biscuits and trimmings, as well as advising on wine or port pairings if you need. You are invited to come to the shop and try the various cheeses for flavour and aesthetic. Our knowledge of cheese at A&H cannot be beaten. Our products are sourced from all over Europe and only the finest cheeses that use the highest-quality ingredients make it into our store. Through a taste consultation, combined with a full explanation of the origins and provenance of each cheese, we can easily identify the perfect flavour combination for your special day. All Rights Reserved, Anderson & Hill. Site by OBC Digital.